Sure, burning calories during your workout is awesome, and it’s to be expected, but training in a way that also keeps those calories burning long after you’ve left the gym? That’s a win-win—especially if fat loss is your goal. You burn energy (aka calories) during exercise as your body works to deliver oxygen to working muscles, which is especially important during higher-intensity workouts. Then, once your workout is over, your body continues burning calories during the cooldown and recovery process, thanks to the increased amount of oxygen needed to repair damaged muscle tissue, clear out lactic acid, and replenish energy. This phenomenon is known as excess post-oxygen consumption (EPOC), or the afterburn effect. There are many different exercise strategies you can use to increase the afterburn effect, but it usually comes down to simply pushing yourself harder during your workouts, says Ryan Campbell, personal training specialist at Anytime Fitness of Southern Wisconsin. Just keep in mind that while specific exercise strategies can help you boost your post-workout calorie burn, they aren’t meant to act as a substitute for a healthy, balanced diet (or to counteract poor eating habits with exercise). Though the exact amount varies per person and activity, research in the Journal of Sports Science suggests EPOC can increase calorie burn by 6 to 15 percent. In other words, if you burned 300 calories during your workout, you may only burn an additional 18 to 45 calories via the afterburn. That said, the cumulative effects of EPOC can make a significant difference if weight loss is your goal. Exercising three times could mean you burn an additional 54 to 135 calories, which can add up—and over time improve your overall fitness and metabolism. There’s one catch that comes along with this progress: As you become stronger and fitter, you’ll need to work harder to keep your EPOC elevated. So be sure to continue challenging yourself by upping the intensity of different workout variables (speed, resistance, frequency, or duration). On board? Thought so. You can boost your post-workout afterburn with one of these expert-approved strategies. And these effects aren’t limited to strength training. People who run for 60 minutes may get a 37 percent higher afterburn effect than people who cycle for 60 minutes, according to a recent study in the Journal of Science and Medicine in Sport. The reason? Running recruits more muscles than cycling. Do it: Incorporate exercises that involve multiple muscle groups, such as push-ups, pull-ups, squats, and lunges into your workouts as much as possible. 2. Lift heavy (or heavier). Do it: Heavy strength training is best left to compound exercises (squats, bench presses, deadlifts). Perform for three to five sets of three to five reps, and rest three to five minutes between sets, says Tamir. 3. Don’t skip high-intensity interval training (HIIT). Bonus: You can burn an impressive 15 calories per minute during a Tabata-style HIIT workout (20 seconds of intense work followed by 10 seconds of rest for a total of eight rounds), according to a study out of the University of Wisconsin–La Crosse. Do it (cardio-lovers): Warm up for five to 10 minutes. Then, pick a cardio equipment of choice (e.g., treadmill, stationary bike, elliptical) and alternate 10- to 60-second sprints with one to three minutes of recovery for a total of 20 minutes. On a scale of rate of perceived exertion (RPE), aim to hit between a 6 and a 9 during hard intervals, and a 4 or 5 during recovery periods, says Tamir. Finish up with a five- to 10-minute cooldown. Do it (iron maidens): Warm up for five to 10 minutes. Then, pick four exercises to target your full body (e.g., jump squats, push-ups, dumbbell deadlifts, and planks). Perform the first move for 40 seconds, take 20 seconds to recover and transition to the next exercise, then perform the second move for 40 seconds, and so on. Tamir recommends running through the four exercises for three to four sets. Cool down for five to 10 minutes. 4. Try metabolic resistance training. Much like HIIT, metabolic resistance training burns fat and challenges your muscles and anaerobic system, says Tamir. You’ll also keep your heart rate elevated by taking short rest periods (think 30 seconds) between sets. The biggest difference between the two workout styles, though, is that HIIT is typically cardio-centric and performed with light weights (or bodyweight-only) for higher reps, and metabolic resistance training calls for lifting moderately heavy weights for 10 to 12 reps, explains Tamir. Once your session is over, your body will have to work overtime to rebuild muscle, restore glycogen (carbohydrates stored in the body as energy), and lower body temperature, which all contribute to that afterburn effect, says Tamir. One great way to ensure you’re continually challenging yourself during your workout—and thereby maximizing your calorie burn during and after—is to use heart-rate-based interval training. With this method, you alternate between bouts of work at a challenging pace (84 to 91 percent of maximum heart rate) with ones at an uncomfortable-but-doable pace (71 to 83 percent of maximum heart rate). 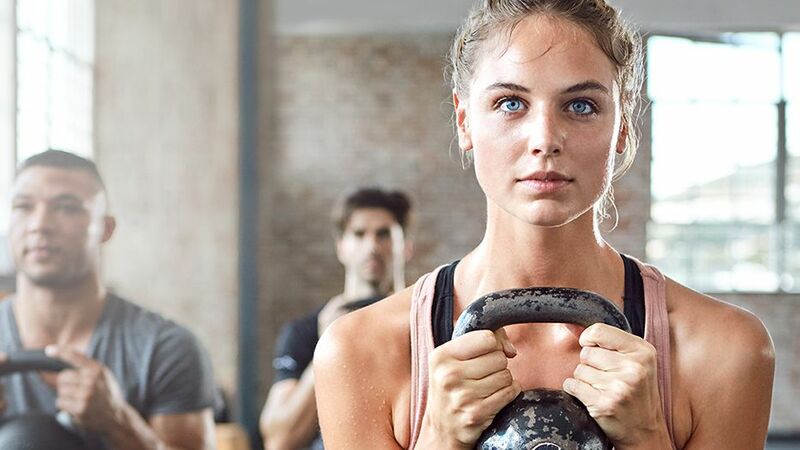 The only caveat is that you’ll need a heart-rate monitor to use this training method, but many of the latest fitness trackers come equipped with this technology and studios such as Orangetheory Fitness use them during their row-run-strength training classes. Do it: Hop on a treadmill, elliptical, stationary bike or another piece of cardio equipment. After a five- to 10-minute warm-up, increase speed or resistance until your heart rate reaches 84 to 91 percent of its max, says Ellen Latham, M.S., cofounder of Orangetheory. (Learn how to find and train in your personal heart-rate zones.) Then, reduce speed or resistance until your heart rate reaches 71 to 83 percent max. If you’re new to heart-rate-based training, start with a six- to eight-minute time block where you alternate between these two paces, and make the last minute as hard as possible. After a few sessions, you’ll get a better sense of which speeds and resistance levels will jack up your heart rate, and which will bring it back down, says Latham. 6. Work in superset exercises. You can increase the intensity—and efficiency—of any strength-training routine by using supersets (performing two exercises back-to-back), says Campbell. While there are a few different types of supersets, a smart option to max out your burn is to pair two exercises that target the same muscle groups (e.g., deadlifts and kettlebell swings, which both target the hamstrings), as this compounds the stress on those muscles and connective tissues, he says. This, in turn, increases the demand for EPOC during the recovery period. The result? You burn more energy both during and after your workout than you would have burned if you’d stuck to straight sets. Do it: Choose two moves that target the same muscle groups (e.g., jump squat and kettlebell goblet squat, which both target the quads and glutes), suggests Campbell. Perform the first exercise for the prescribed reps or time, then move right into the second exercise. Rest 30 to 60 seconds and repeat. 7. Max out with finishers. Another simple strategy to make your strength-training session more challenging—thereby boosting EPOC—is to use heavier weights during the final two or three reps of a strength exercise. “When you increase the weights you’re using, even if it’s only for the last few repetitions of each set, you’re exerting yourself at a level that’s uncomfortable,” says Latham. That little bit of added discomfort increases the demand on your energy systems, as well as the wear-and-tear on your muscles, ultimately helping you burn more calories overall. Do it: As you near the end of your set, swap out your weights for slightly heavier ones, she says. For example, if you’re using 12-pound dumbbells for a set of walking lunges, move up to 15-pound dumbbells for the last two or three repetitions.